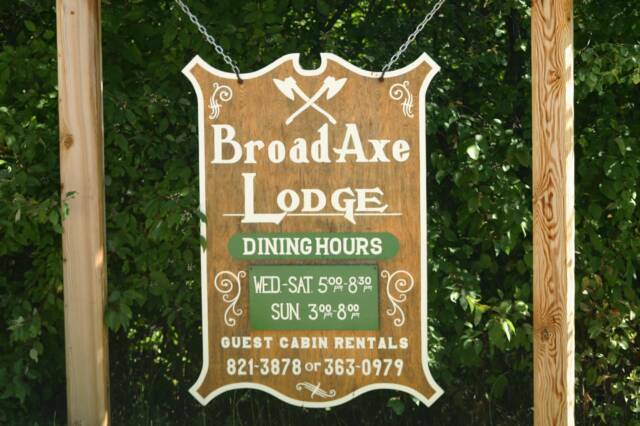 Welcome to the Broad Axe Lodge and Restaurant. We know you will enjoy your stay with us here in the heart of the Bitterroot National Forest. Our spacious cabins are complete and comfy, with full baths, kitchens, queen size beds and sunset porches. Dining in our lodge is a special experience with unique views of Bighorn sheep, deer and elk grazing on nearby hillsides. You can sometimes glimpse an eagle soaring or a black bear scurrying across the hills. Individually prepared dinners include charbroiled steaks, prime rib au jus, various chicken and seafood entrees and daily specials. Our fresh salad bar and homemade breads are included with your dinner. And be sure to sample one of our homemade desserts. Enjoy your favorite beverage from the lounge. Activities are virtually limitless in the Bitterroot Valley of Western Montana. Some of the more popular interests are fly fishing, hiking, wildlife photography, bird watching, river float trips, horseback riding, big game hunting, cross-country skiing, snow-shoeing and natural hot springs swimming. Berry picking in the forest is fun too, and the wild flowers are spectacular.